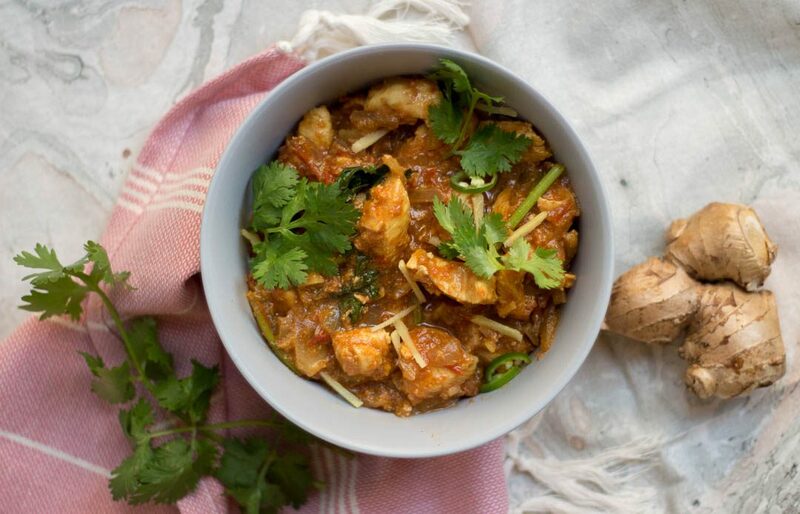 With the aroma of sliced ginger and lots of fresh coriander on top, this Pakistani style ginger chicken is sure to delight family members and guests. It’s a simple day today and it calls for a simple recipe. 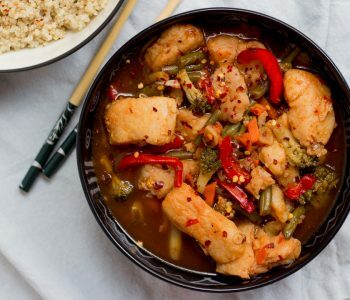 This Ginger Chicken, Pakistani style is one of the easiest recipes I know. 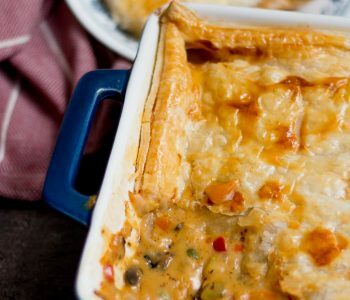 It’s a great option to put in the weekly rotation of what to cook for dinner. 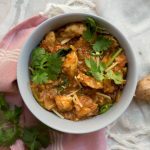 It’s also well suited for parties and special occasions, since it looks different from the daily murghi ka salan but the spices and flavours are still familiar. All it requires is the standard Pakistani cooking arsenal of onions, tomatoes & spices stirred & cooked together. But what creates the delicious medley of flavors in the dish is the finely julienne ginger added right at the end with a heaping handful of fresh fragrant coriander. 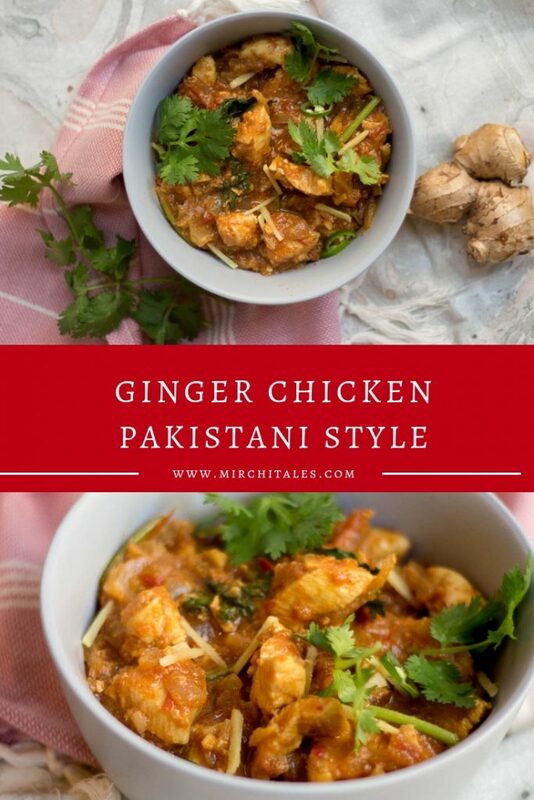 The reason I call it ginger chicken Pakistani style is to differentiate it from the Asian style ginger chicken that is usually flavoured with soy sauce and vinegar. 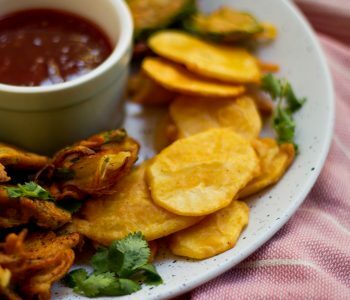 Serve it with rice or roti, but do not forget the coriander and ginger! Heat oil in large pan on medium high heat. Once oil is hot, add freshly grated ginger/ginger paste and garlic paste and saute for 1 minute till the flavor comes out. Add onions and saute till light golden (about 5-7 minutes). Keep stirring so that the onions don't burn. Add chopped tomatoes along with the rest of masalas (turmeric, coriander powder, salt & chilli powder). Keep stirring till the tomatoes thicken and becomes a jam-like consistency. Add the chicken along with 1/2 cup to 1 cup water and let it cook on high heat for 2-3 minutes then turn it on low-medium till chicken is tender. It will take approx. 15-20 minutes for boneless chicken, whereas chicken with bone will take about 30-40 minutes. Once the chicken is ready, you should see the masala oil on top of the tomato gravy. Approximately 5 minutes before the chicken is done, add tomato ketchup/tomato puree. Add about 90% of the julienned ginger on top of the dish, and let it cook for a minute then take it off heat. Garnish with fresh coriander and the remaining sliced ginger. Serve with naan/chapati or fresh steamed basmati rice. A quick way to make fresh ginger paste is to use a grater. Just cut off a piece of ginger, and grate it on the sides of a small grater.